At the back of The Manchester College we have a sustainable growing dome ‘The Geodome’. The Geodome aims to inspire and excite young people to understand where their food comes from. It is part of the REAL FOOD WYTHENSHAWE project promoting sustainable food and aims to introduce students to the issues around environmental change and food security whilst promoting sustainability and encouraging students to become Real Food Ambassadors for the future! The Geodome houses aquaponics, vermiculture, hydroponic and mushrooms, working together to produce healthy sustainable food for the college students and local residents. These can be offered as one-off sessions or as part of a more structured programme of activities. This tour provides opportunity for students to experience several areas of the Real Food Wythenshawe Project over a few weeks, picking up ‘a passport of skills’ along the way. Are you interested in helping care for our Tilapia fish, growing vegetables and harvesting our Geodome veg? Rachel will be at the Geodome every Thursday morning and would welcome volunteer help. 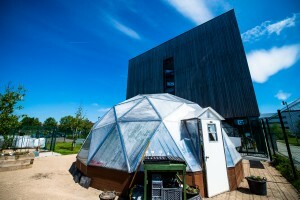 MEET: The Geodome is at the back of the Manchester College (on the junction between Brownley Road and Hollyhedge Road). Please sign-in at the college’s reception and they will direct you. If you would like to get involved or know more information, please contact Rachel Harding (Food Education and Skills Co-ordinator) Rachel.harding@wchg.org.uk or by contacting her on 0161 946 9168. Over 35 students have been involved with the construction of the Geodome. Students are involved with the external landscaping, nature trail and fruit and vegetable planting as part of their Horticulture qualification. Construction students have also built the 26ft diameter polycarbonate geodesic dome greenhouse, which will house growing system. Food and plumbing students will work closely with a specialist company to fit out the Geodome with the growing systems (vermiculture, aquaponics, hydroponics and fungiculture).